Here is how the Sound Check Card works. 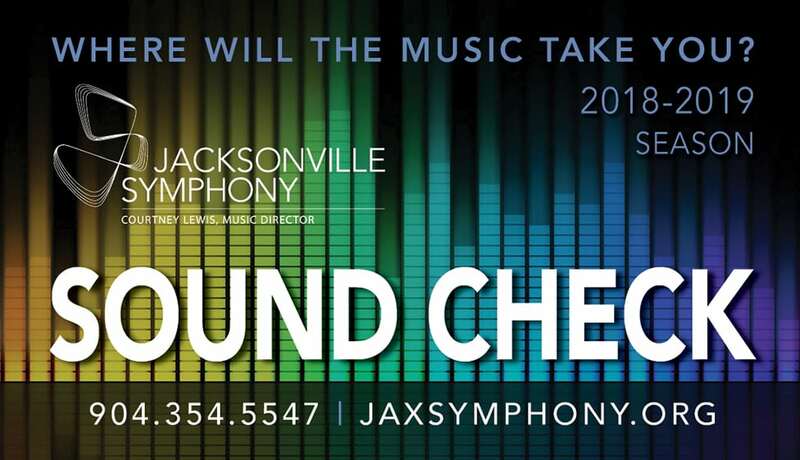 We want you to have a fun experience at the Jacksonville Symphony and come back often with your Sound Check Card. Sound Check Cards are for students age 25 and younger. Sound Check Cardholders may bring one guest (parents included) at $15 each. Concert entry available at the Symphony Ticket Office on day of concert with Sound Check Card and valid ID when applicable. The Ticket Office opens 90 minutes prior to the concert start time. Sound Check Card must be signed and presented with valid ID. Sound Check Cards apply toward Masterworks and Coffee series concerts and other select concerts for as many visits as the cardholder wishes. Sound Check Cards are valid for one season only. Concerts may sell out! Call the Ticket Office at 904-354-5547 for information prior to the concert and arrive early. If you purchase a Sound Check Card for your child, please call the Ticket Office and register the card in his or her name. You are invited to attend all Sound Check events and accompanying pre-concert presentations for $15 each. Additional events may be added throughout the year. Just $25 for the entire season!